We got hit with Nintendo Server Maintenance on Wednesday so I decided to postpone cycling and switch over to Happy Home Designer. Hmmph, they should of know that Wednesdays are for cycling. Good thing Peck was able to find a home this time around! I was worried because the server maintenance prevented anyone from adopting. Littlerollingfox picked up that fedora from the pile of goodies at the train station. Rocco's house looks like it's been under some serious construction. He is a good cranky villager to have in your town for those Zen public works projects! I think the Bristol Bow looks much nicer on him. I would defiantly would choose this look over the crime scene striped tape shirt. Need a visual reference? Here. Oh miss Renee. The one who asks for the vacant lot on HHD. There aren't that many purple villagers in ACNL so she is a pretty good pick. Blacksigma matches her with that hair color! I really enjoy Rory's pirate wall, Vic the viking Bull villager has it as well! I wonder what kind of furniture he has. We can never see since they are always in boxes packed and ready to go. Pekoe was the most wanted villager of the night! A very vicious raffle but the lucky winner was my lovely streamer friend, Lysee6! Pekoe is also extra special because she is wearing the famous Bristol Bow. 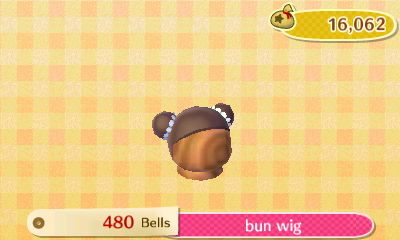 Everyone can twin with her by wearing the Bun Wig. When Barold first moved to town, I called him Boyle by accident. That seems to be a reference to Elmer from The Fairly Odd Parents. Barold is a lazy villager and has a serious five-o-clock shadow. Last villager of the night was Yuka, the Koala! The lemon gingham looks so adorable on her. Her picture on the wiki makes me think she is a Peppy but she is actually super snooty. Snooties usually have attitude in their photos hehe. Pekoe's moving day landed on the day we all love! Festivale! Luckily I have Shampoodle's unlocked in this town so I was able to have Harriet make me look like less of a mess for this special occasion. I even bought the whole get up, accessories and all. I hope you all enjoy cycling town and the updates that I give. Please continue to use this blog as a reminder and guide to who is in town! See you all next time for some more!